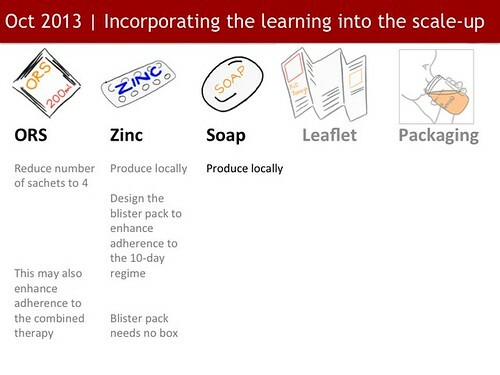 The reasons for doing the ColaLife Operational Trial in Zambia (COTZ) were: to generate robust evidence of what works and what doesn’t; learn and improve. Following the trial, we did a root and branch review of the Kit Yamoyo design – looking again at each component including the packaging. Our key objective in this review was to reduce costs without sacrificing functionality. This process took a lot of resolve given that the Kit Yamoyo in its original trial format had achieved so much acclaim and won so many awards. But as someone in business once said “the main thing is to keep the main thing the main thing”. And we were not in the business of winning awards, we were in the business of saving lives. If the trial was telling us there are improvements to make – they needed to be made. The smaller ORS sachets which we designed that made up just 200ml as opposed to the standard one litre of solution were a big success. When combined with the measuring functionality built into the packaging, this led to 93% of mothers/carers mixing the ORS correctly. Only 60% mixed the ORS correctly when given one litre sachets.Another significant finding was that 85% of carers only used 4 sachets or fewer with an additional 10% using all 8 of the sachets provided. We have assumed, fairly safely, I think, that the 10% of women who used all 8 sachets did so because they thought they needed to finish the course, not because the child was still dehydrated. This means that 90-95% of carers needed 4 sachets or less. It means that there will be fewer sachets left (if any) after the treatment of a child which in turn means that a second bout of diarrhoea in the household is less likely to be treated with left-over ORS sachets and no Zinc. 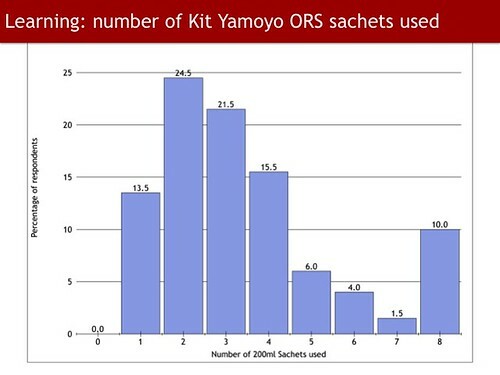 Instead, another Kit Yamoyo is more likely to be bought and the recommended combined treatment be given. 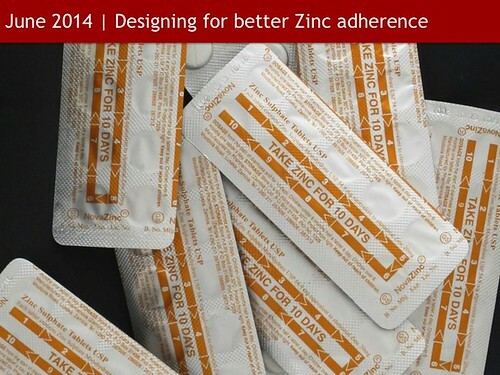 … can we apply design to increase Zinc adherence? In the trial we had a major effect on the correct use of ORS through design: smaller ORS sachets and using the packaging as the measure for the water. 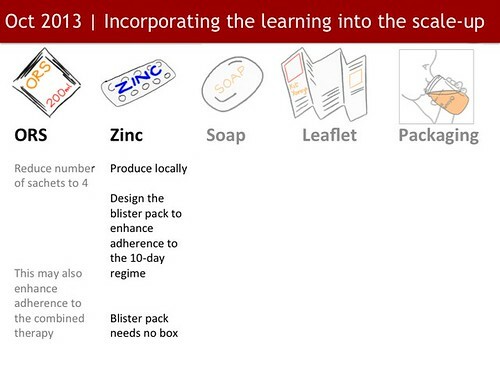 So we’ve applied better design to the Zinc packaging to see if this will help increase adherence to the 10-day regime. Finally, Pharmanova, our pharmaceutical partner has been inspired by the trial to produce its own Zinc locally – the Zinc we used for the trial had to be imported from Tanzania. 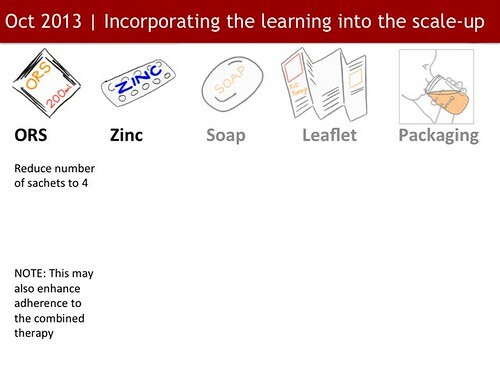 Again, this will reduce costs: not only will the local Zinc be cheaper but it will not need its own box and PIL (Patient Information Leaflet) – small items, but each increases cost. 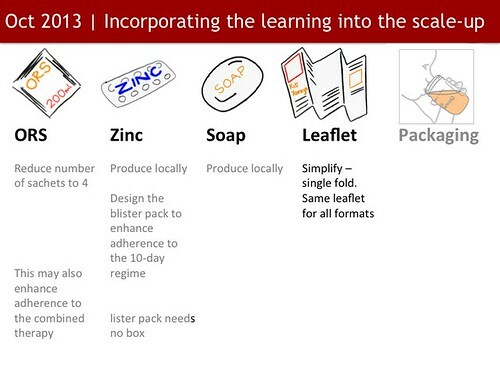 In addition, producing the Zinc locally means that we can use our own packaging design. 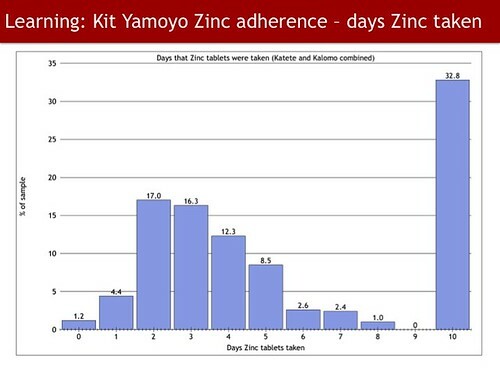 Pharmanova has now completed stability testing of the new, locally produced Zinc and in two weeks it will be with the regulator for approval, with our own packaging design which carries the very prominent “TAKE ZINC FOR 10 DAYS” message. We will have to wait and see if this further improves adherence to the 10-day regime. Next up is the soap. The soap used in the trial was imported from India, as no small soap was available locally. There is only one manufacturer of soap in Zambia (Trade Kings) and at the time of the trial they did not produce a small bar. We have had discussions with Trade Kings and they are about to start production of a 25g soap bar. This will be aimed at the tourism sector and the sort of small shops that are selling Kit Yamoyo. This local soap will further reduce the cost of the kit. It is important to include clear, graphical instructions. 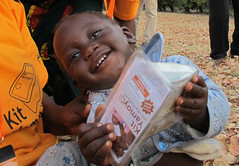 Only around 20% of users read the leaflet within the Kit Yamoyo and it was relatively expensive to produce. It was in two local languages and English, and had multiple folds.We were applauded for producing the leaflet with instructions in local languages. It was considered a ‘good thing’. However, we learnt during the trial that although someone might speak a local language, it does not mean they can read it. Indeed, if a person can read, they are most likely to read English rather than their local language. So, the new leaflet is a simple, single-fold design with very little text, in English. Instead of using multiple languages, we have concentrated on getting the instructional graphics as clear as possible.As before, the leaflet carries the branding; the pack itself is not branded. This means that branding can be changed simply by inserting a different leaflet. 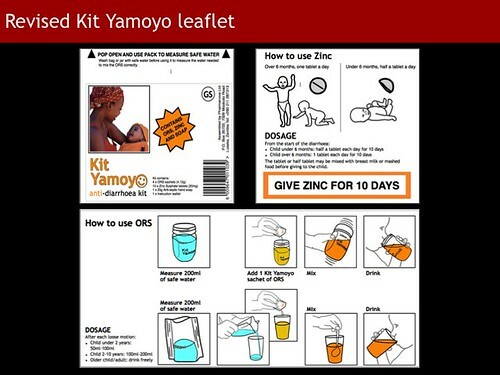 In the scale-up,for example, we may wish to produce an ‘unbranded’ version of Kit Yamoyo for distribution through the public sector.The branding is carried on the front of the leaflet (top left in the slide opposite); Zinc instructions are on the back and the centre-fold carries the ORS instructions. Finally we come to the packaging. A key finding from the trial, which we have reported on before, is that very few retailers (4%) used the space between Coca-Cola crates to transport Kit Yamoyos back to their villages. Designing the Kit Yamoyo to fit into Coca-Cola crates was a nice idea but ended up being a feature of the innovative packaging not a benefit. This finding frees us up to be even more creative with the packaging design AND reduce its cost. So for the scale-up, and with the help of PI Global and Amcor, we have developed two packaging designs: a screw-top and a flexi-pack. 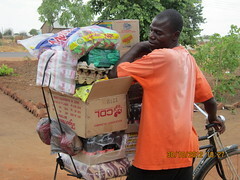 The screw-top is 40% cheaper than the original packaging (the aidpod) and can be made in Zambia now. The flexi-pack is even cheaper. 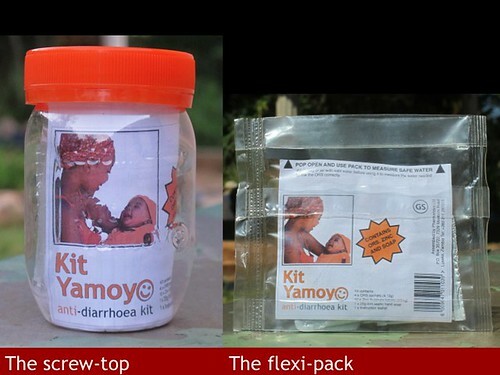 The flexi-pack Kit Yamoyo will retail at the same price as in the trial version (K5.00) but due to the cost reductions outlined, will not require any subsidy. The screw-top will be 60% more expensive than our K5.00 target; it would need to retail at K8.00 unsubsidised. Both formats retain the all-important measuring function but the flexi-pack cannot easily be used as a mixing device, storage device or cup. 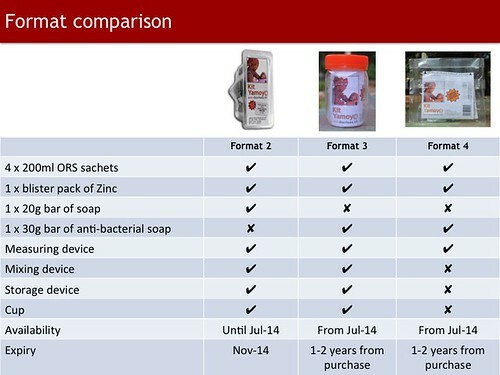 The scale-up formats are compared in the table to the left and a demonstration of the flexi-pack in use is shown in the video below.These slides and notes can be downloaded as a PowerPoint presentation from ColaLife’s SlideShare channel here.Do you have any ideas on design improvements or cost reductions? We’d love to hear from you! 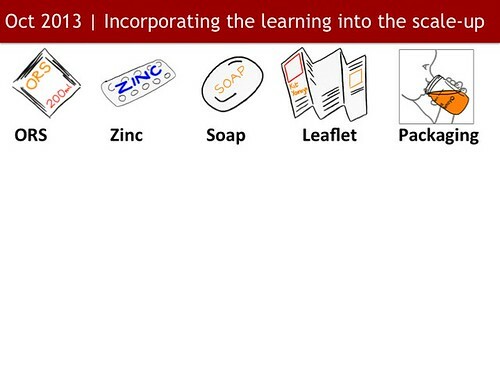 Great to hear about the learning a from he trial and your planned product developments. – use a plastic cup with a foil lid as a low cost packaging solution (the kind of thing used for juice or water in airline meals, etc. I guess this would be slightly more expensive than the flexi pack but significantly cheaper than the screw top – and it would have much greater utility. – bundle the screw top with the flexi pack – the screw top starter pack with the flexi pack ‘refill’. This may enable an even cheaper flexi pack. I’ll keep my thinking cap on, but hope these thoughts might be helpful if only to trigger others. Best wishes to all the ColaLife team.